Purchased in spring 2007 with funds provided by the Friends of the Princeton University Library. 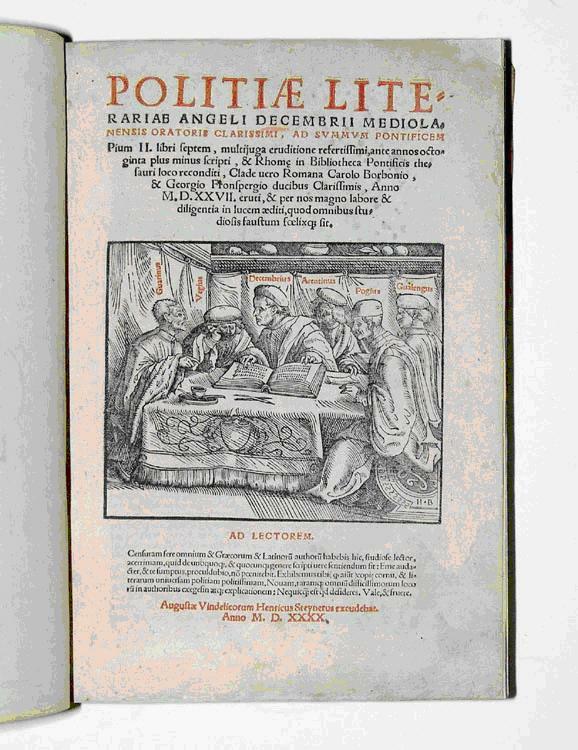 Professor Anthony Grafton’s comments on this book: “The Milanese humanist Angelo Decembrio provides in his De politia litteraria a uniquely vivid, if fictionalized, record of literary life at the court of Ferrara in the age of Leonello d’Este. His court was the favorite habitat of the great humanist teacher Guarino of Verona; the architect, humanist and theorist of the arts Leon Battista Alberti; the poet Tito Vespasiano Strozzi; and many other scholars, writers, and erudite soldiers of fortune. In Decembrio’s unique dialogues we listen to these men debating the value of ancient and modern poetry, discussing the quality of Flemish tapestries and other works of art, examining the Egyptian obelisk that still stands in Vatican City in the Piazza S. Pietro; and describing the ideal renaissance library and how it should be kept. The text has fascinated students of the Renaissance for the last century and more, and parts of it have been edited (the one on the obelisk, for example, by Brian Curran, now of Penn State, and myself; that on works of art by Michael Baxandall). “In collaboration with Christopher Celenza of Johns Hopkins, I plan to edit and translate parts of this text, … But it won’t be an easy text to edit. Decembrio’s work survives in two distinct recensions: one preserved in a Latin manuscript in the Vatican, of which we have a full copy; the other in two printed editions based on a manuscript stolen from the Vatican in 1527 and now lost. The differences are multiple and subtle, and the supposedly critical edition that appeared four years ago in Germany is very problematic. We [can] collate the divergent texts far more easily [now that] Firestone ha[s] both printed texts. I’d love to hear these text translations. Since this is an old post I was wondering if you had translated much of the text yet and if so, where I could find it?